Spread with butter and prepare to bake more. Just as good as wheat based versions. I should say that all links to other sites are there to credit the original recipe, but I’m in no way affiliated with the site and can’t guarantee anything about them. I link back because it’s the right thing to do and respectful, but do be safe when checking out any sites, whether they be blogs or shop-fronts. I’m just throwing that out there, I should say it more often. I should also apologise for the rushed quality of these two posts, I’ve been under the weather lately, still chugging along, you can’t keep Jack, down! It’s just I want to type these up before I forget them entirely. In saying that they may be just fine then just disregard what I said. I could’ve used the full amount, but this was enough for me. I’ve been on the look out for more uses for buckwheat flakes and when I saw a porridge bread style recipe I had to try it. I won’t keep you in suspense, it’s was okay. 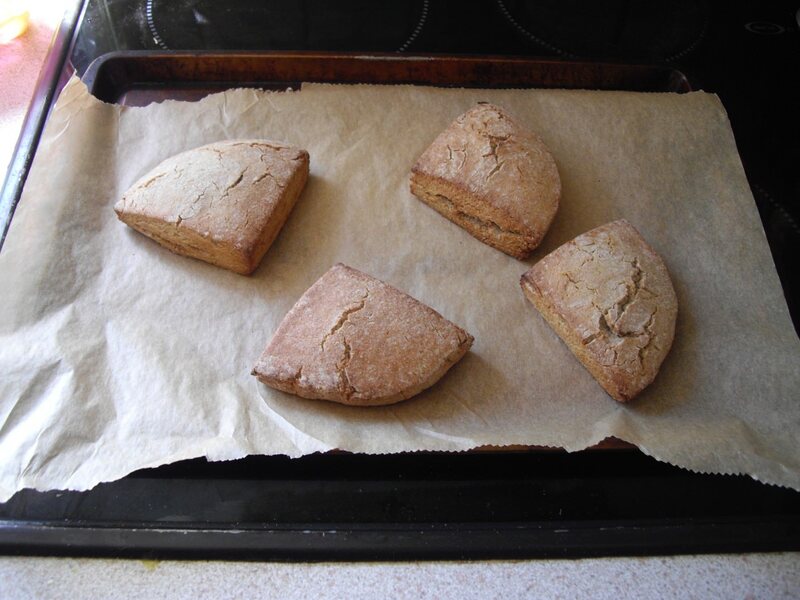 A tad bland, but it came together just as well as my previous porridge bread and perhaps with a few more ingredients it could be something special. It just wasn’t for me, I found it too bland and slightly chewy. I have my Nutty Banana Buckwheat Bread to keep me going, but if you are interested in this style of bread but like me can’t eat oats then you might find this useful. That’s what I think is important in trying new recipes: Even if I don’t like them there may be someone who really would so I try them and am happy to be able to share them. I did try another recipe a carob and hazel spread that went awry. My carob is really dry it seems, even with tweaks I couldn’t salvage it, but I saved half the Hazelnut Butter so I’m happy. It’s so good! That’s it for now. Until later. I’ll be in the garden…probably asleep. 1. Preheat oven to 180c (No Fan). 2. Grease and line a 6×3 inch loaf pan. 3. Mash the Banana until smooth and then beat in the Peanut Butter and Olive Oil until completely combined. Mix in the Flakes until a thick sticky batter has formed. 4. Scoop batter into prepared tin and bake for 45 minutes, turning halfway if needed, until golden brown and a skewer comes out clean. 5. 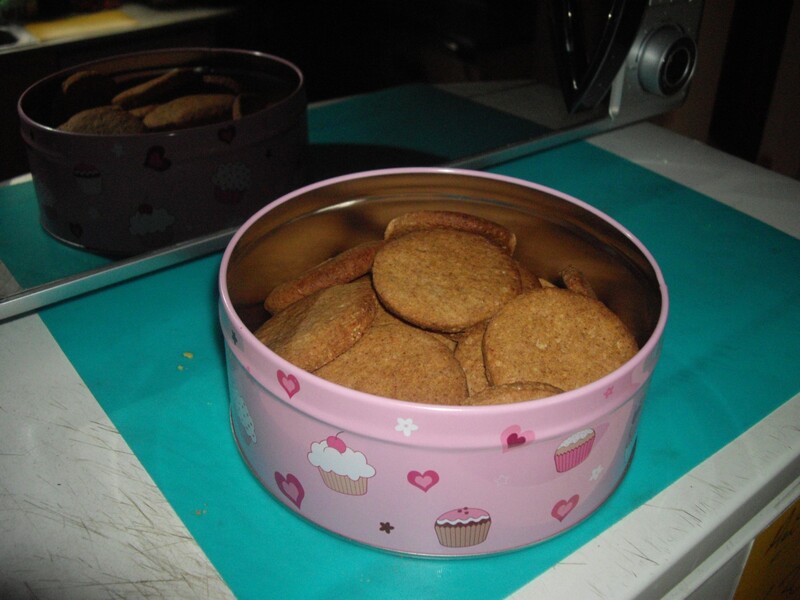 Cool in tin for 10 minutes, then remove and let cool completely on a wire-rack before slicing. My hand looks huge. They’re really not that big, really. SMASH PUNY Blo…er, honest. 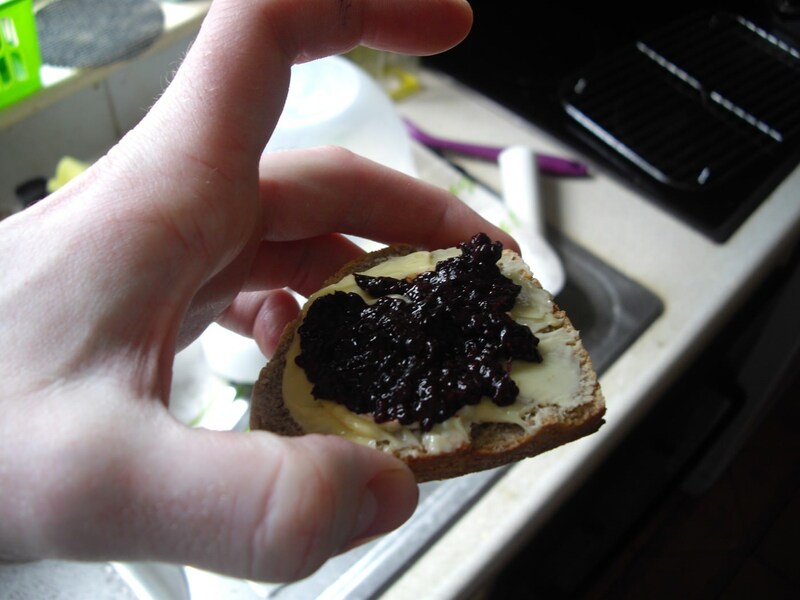 These are great fresh outta the oven with butter and Chia Seed Jam. I feel a rambling post coming on, so skip to the bottom if you’d just like the recipe. Okay, firstly these have been tweaked from Foodie Underground, the original is egg-less and features a more flavoured scone so please do check it out. I wanted something closer to the scones I grew up on so I decided to go for a slightly plainer version. I added an egg to help soften the inside and in future I may consider using flax or even an additional egg. Not to say these aren’t wonderful, but me not tweaking a recipe endlessly is just impossible. Okay first fork in the road to sconesville. I also made some Buckwheat Gnocchi (And my dinner of Garlic Butter Quinoa, Cumin Chicken and Sautéed Sweet Potato) because the kitchen was quiet and I will multi-task to the point where even I’m not sure what cooking. Just a small tip for even gnocchi, something I should have realised from making Peanut Butter Cookies by bashing a Tablespoon on the side of the bowl (It works, I have a scoop now, but it had its uses), use a half-tablespoon or even a teaspoon to measure out the dough. 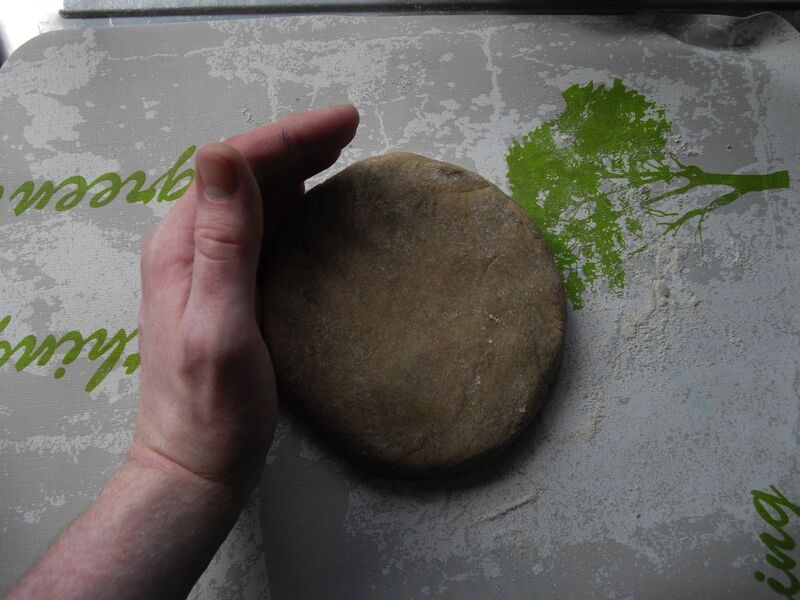 It’s easier to roll it out in your hands as you won’t have to keep reworking and thus warming the dough. So, yup, simple, but not always obvious tip. I should update the recipe too. Big but even. I like sharing little tips as they occur to me as you never know what’ll help someone. Now, onto the scones. ‘nother tip: Using both hands (I had to take the photo with the other) smooth the sides of the dough using a clock-wise circular motion with both hands to give the scones nice round edges. As I said I added an egg to this so that it perhaps changed the texture of the dough, I’m not sure, but it was really easy to work with. It came together fast and didn’t require much flour to roll it out. There isn’t much to do and even if you’d rather use cutters to make the scones smaller you’d still be able to do it with ease. I just felt like taking the easy way and running a knife down the dough. Just don’t make them too thick or too thin, about an inch or so should be fine, you don’t need to be too exact. I was cooking sweet potato at the time so I certainly wasn’t measuring exactly. Smooth edges and crooked portions…oops. How they tasted is probably important too. They aren’t exactly what I remember as scones, but when you eliminate the gluten, whatever remains, no matter how different, will still be delicious. If you accept that they won’t be the same as gluten based and remember that they’re still far better than starch and gum based simulacrum (I rag on that a lot because I believe we’re too reliant on copying what gluten can do instead of celebrating what other flours can achieve on their own merits), then you’ll find a crispy exterior, a slightly soft interior and on the whole a really delicious scone that goes well with a cup of tea. I did find that even with a little sugar that they were really sweet. I have found sugar and buckwheat to sometimes be at loggerheads with one another, it seems to suspended in the flour in certain recipes, it was fine here, but I wouldn’t add any more. The only caveat is that these are best fresh out of the oven and eaten on the same day. After a few hours they still start to harden and become slightly brittle. You could probably ditch the egg and halve the recipe again to make a small serving so it’s not a problem really. I’ll return to this recipe again so keep your eyes peeled. 2. Add all the dry ingredients to a bowl and then stir in the Olive Oil with a fork until combined, then mix in the Egg until everything has mixed together. Finally add in the Milk, a little at a time, until the dough starts to come together. Knead as necessary. Dough should be firm and not sticky. Form into a ball. 3. Dust a work surface lightly with flour and either press the dough flat, about an inch thickness, and cut into wedges or roll out and cut into rounds using a cutter. Then place onto the prepared tray. 4. Bake for 12-15 minutes until scones are firm and a light brown colour. Transfer to a wire-rack and let cool. Best eaten warm and on day of baking. 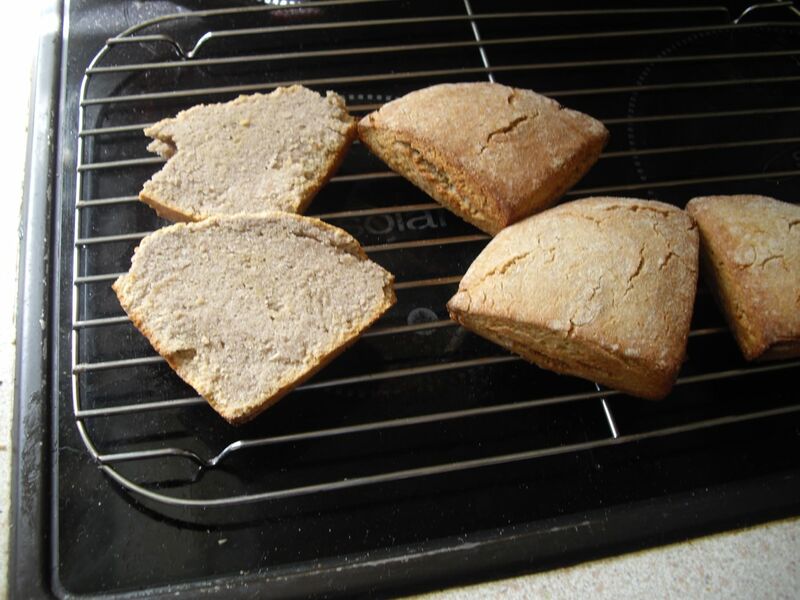 Flax and Buckwheat: Use 30g Flax, 170g Buckwheat Flour. Halved: Half the ingredients, except the Egg, and leave out the Milk. Mix as normal. Dough will be slightly stickier, only add Milk if too dry. Scones will be slightly lighter in colour. Having to eat it hot out of the oven is a bonus in my book. 1. Add the dry ingredients to a bowl and shake until combined. 2. Rub in the Butter and crumble together with hands until it forms a lumpy, dry breadcrumb like mixture. Add a Tbsp of Cold Water and mash together with fork. 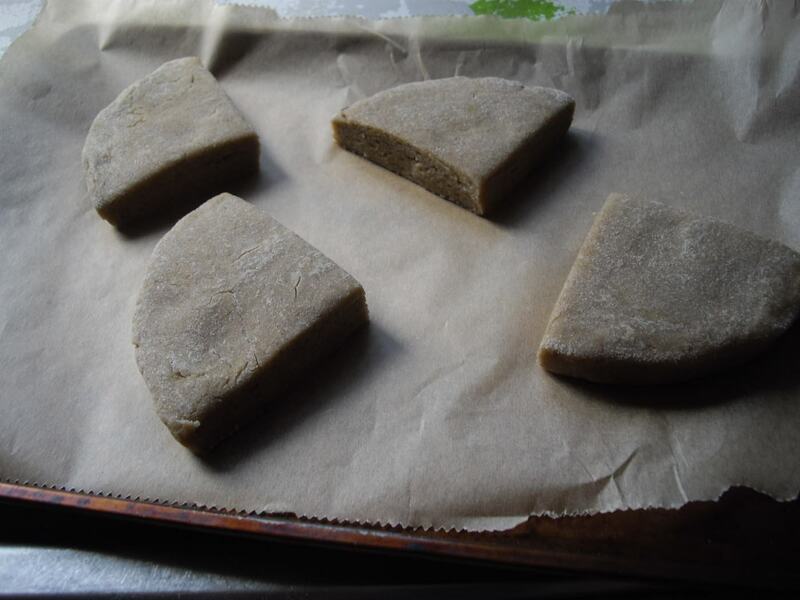 Keep adding Water and mixing until a soft sticky Dough is formed. Form into a ball, cover and leave in the fridge for half an hour. 3. Preheat the oven to 190c (Fan) and line a baking tray with greaseproof paper. Dust a work surface with Flour and roll out the dough, reworking as necessary, to a 3mm thickness. Cut out rounds of about 2 1/2 inches and place onto the prepared tray. 4. Bake in the oven for 12-14 minutes, turning halfway, until the edges start to turn brown and then flip over the biscuits and cook for another 2 minutes. Remove to a wire-rack to cool completely. 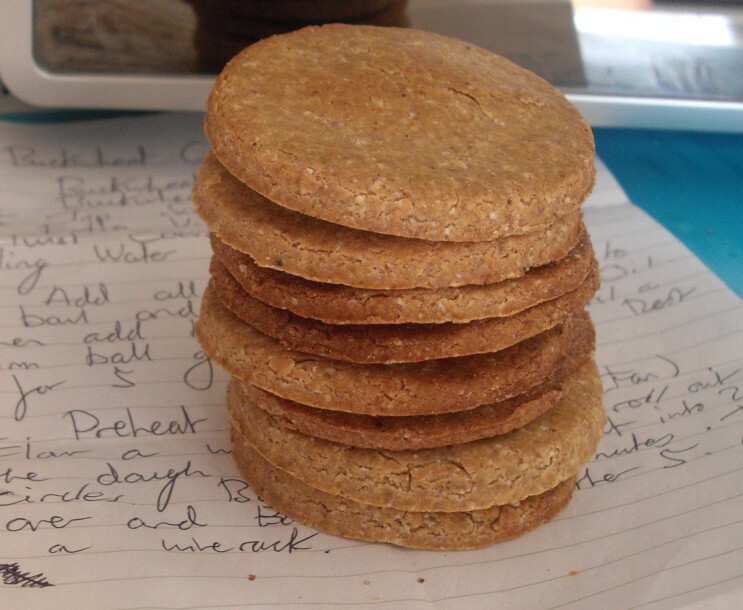 These are just like the oatcakes I once survived on until I realised that the oats were causing me trouble, that was probably my first step towards understanding histamine intolerance. These are simple to make and they freeze just fine, they’d make a great lunch box filler and are just as tasty plain as with a filling. Makes 8 Buckwheat Cakes. Can be frozen. 1. Add all the dry ingredients to a bowl and shake together, then mix in the Oil with a spoon until everything is combined. Add in the Water, as needed, until a firm and slightly sticky dough has been formed. Roll into a ball and dust lightly with Flour, then let rest for 5 minutes. 2. Preheat oven to 180c (Fan) and line a baking tray with greaseproof paper. Dust a work surface with Flour and roll out the dough, reworking as necessary, to a 5mm thickness. Cut out rounds of about 2 1/2 inches and place onto the prepared tray. Bake in the oven for 20 minutes, turning halfway, until the cakes start to turn a light brown colour and then flip over and cook for another 5 minutes. Remove to a wire-rack to cool completely.